The global fatty acid esters market is prognosticated to witness a steady growth in the forthcoming years, as reported by Transparency Market Research (TMR). The global market for fatty acid esters has a vendor landscape featuring substantial opportunities for new participants, along with potential for formation of strategic partnerships among the existing players. Vendors are anticipated to gain from expansion to emerging regions, by tapping into the vast opportunities offered by them. Key players profiled in the report include Henan Eastar, Zhengzhou Dahe Food S&T Co. Ltd., China Top Chemical (Jiangsu) Co. Ltd., Cremer Oleo, and Chemicals Co. Ltd. According to TMR, the global fatty acid esters market is estimated to rise at a 4.1% CAGR over the forecast period of 2014 to 2020. Over this duration, the market is envisaged to hold US$2.24 bn by the end of 2020, rising from US$1.70 bn in 2013. 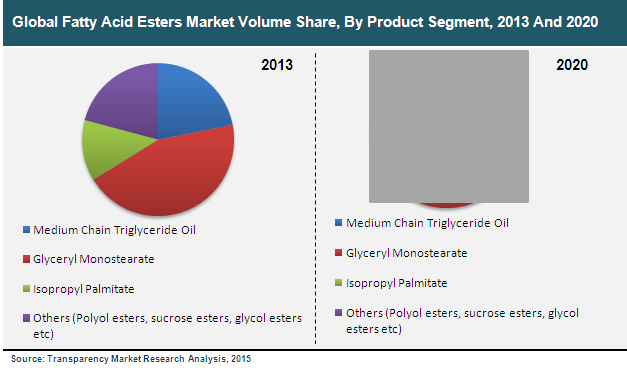 Among all the product segments, glyceryl monostearates were touted to be the leading segment, holding roughly 40% of the overall market share in 2013. Geographically, the regional market in North America held a lion’s share of the global fatty acid esters market, and this trend is expected to continue over the duration of forecast. The growing demand from the cosmetic industry for isopropyl palmitate is anticipated to fuel the global market for fatty acid esters. Other product types such as sucrose esters, glycol esters, and polyol esters could account for a relatively smaller market share. Nevertheless, due to growing applications of these esters in industries such as surfactant, pharmaceutical, and paper, they are projected to grow their global annual production in future. Several creams and lotions for skin, hair, and even infant care contain these esters as a sustainable, dermatologically safe alternative to toxic synthetic chemicals & ingredients. Positive eco-profile and increased functionality of the product has led to high demand in niche applications such as thickening, anti-irritant, water solubility and pigment wetting agent. Used in the food industry as an emulsifier and a thickening agent, GMS forms a significant market share of the world fatty acid esters market. Using MCT, man-made fats prepared from palm oil, in food items helps to burn calories to reduce weight. Another fatty acid ester produced by palm oil, isopropyl palmitate is used as a thickening agent and emollient in the production of cosmetics such as creams and lotions. The shifting focus of end users towards biodiesel over conventional diesel owing to its low toxicity is expected to be one of the major factors driving the growth of the global fatty acid methyl ester market. Additionally, rise in the usage of fatty acid methyl esters as a green solvent owing to its low VOC and biodegradable nature is further expected to escalate the growth of the global fatty acid methyl ester market. Fatty acid methyl ester has high boiling point, high lubricity and IS highly soluble in organic solvents. Due to the aforementioned properties, there is increasing demand for fatty acid methyl ester from metalworking fluids, detergents & surfactants, fuels and many other industries, which in turn, is expected to drive the growth of the global fatty acid methyl esters market during the forecast period.